Truth is, most old recipes were not much more than shopping lists with cursory prep notes. Detailed instructions were not considered necessary because it was understood that whoever cooked the food already knew the basics. Measurements are time/country/food specific. Standard measurements and detailed cooking instructions were a by-product of the Industrial Revolution and are commonly attributed to Fannie M. Farmer, principal of the Boston Cooking School." Up until the 1950's both the US and Britain used the same basic measurements. The US ones were called US Standard and the Britain ones were called Imperial, some of the measurements differed slightly in actual size, weight, or volume but utilized the same names. Britain did not go metric until officially until the early 90's as a result of the EU sanctions. Very slow oven below 300 degrees F.
Slow oven 300 degrees F.
Moderately slow oven 325 degrees F.
Moderate oven 350 degrees F.
Moderately hot oven 375 degrees F.
Quick oven 375 - 400 degrees F.
Hot oven 400-425 degrees F.
Very hot oven 450-475 degrees F.
"Correct measurements are absolutely necessary to insure the best results. but the majority need definite guides." Tin, granite-ware, and glass measuring-cups, divided in quarters or thirds, holding one half-pint, and tea and table spoons of regulation sizes,—which may be bought at any store where kitchen furnishings are sold,—and a ease knife, are essentials for correct measurement. Mixing-spoons, which are little larger than tablespoons, should not be con-founded with the latter. Firmly packed: With a spatula, a spoon, or by hand, the ingredient is pressed as tightly as possible into the measuring device. Lightly packed: The ingredient is pressed lightly into the measuring device, only tightly enough to ensure no air pockets. Even / level: A precise measure of an ingredient, discarding all of the ingredient that rises above the rim of the measuring device. Sweeping across the top of the measure with the back of a straight knife or the blade of a spatula is a common leveling method. Rounded: Allowing a measure of an ingredient to pile up above the rim of the measuring device naturally, into a soft, rounded shape. Heaping / heaped: The maximum amount of an ingredient which will stay on the measuring device. Sifted: This instruction may be seen in two different ways, with two different meanings: before the ingredient, as “1 cup sifted flour”, indicates the ingredient should be sifted into the measuring device (and normally leveled), while after the ingredient, as “1 cup flour, sifted”, denotes the sifting should occur after measurement. Flour, meal, powdered and confectioners’ sugar, and soda should be sifted before measuring. Mustard and baking powder, from standing in boxes, settle, therefore should be stirred to lighten; salt frequently lumps, and these lumps should be broken. A cupful is measured level. To measure a cupful, put in the ingredient by spoonfuls or from a scoop, round slightly, and level with a case knife, care being taken not to shake the cup. A tablespoonful is measured level. A teaspoonful is measured level. To measure tea or table spoonfuls, dip the spoon in the ingredient, fill, lift, and level with a knife, the sharp edge of knife being toward tip of spoon. Divide with knife lengthwise of spoon, for a half-spoonful; divide halves crosswise for quarters, and quarters crosswise for eighths. Less than one-eighth of a teaspoonful is considered a few grains. A cupful of liquid is all the cup will hold. A tea or table spoonful is all the spoon will hold. Measuring Butter, Lard, etc. To measure butter, lard, and other solid fats, pack solidly into cup or spoon, and level with a knife. When dry ingredients, liquids, and fats are called for in the same recipe, measure in the order given, thereby using but one cup." Steam asparagus, about 4-5 minutes. Transfer to a colander to cool. Place 1 sheet of phyllo on a work surface (cover the remaining phyllo with a damp clean towel). Cut into 4 rectangular pieces. Cut the asparagus spears down to 4 inch lengths. Place 1 piece of prosciutto on each phyllo rectangle, lining up along 1 short edge. 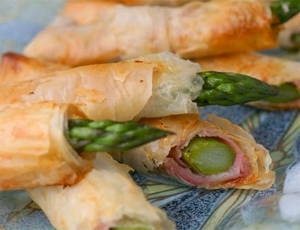 Arrange an asparagus spear over the prosciutto, letting the tip lay beyond the top edge of the phyllo. Sprinkle with Parmesan (I like it more than most). Roll up and secure the edge of the phyllo with butter, if necessary. When rolling, leave the asparagus tip unwrapped about one inch. Wrap foil around the exposed asparagus tip so it doesn’t burn. Arrange on prepared baking sheet. Bake until phyllo is golden brown, about 5-10 minutes.